You may be looking for Vladimir Putin and not even know it! The human face of power and middle management. Dmitry Putinovich Medvedev (Russian: Димо Медвед) is the undisputed Prime Minister of the Russian Federation. Medvedev is noted for his harsh stance on individuality and for his loyalty to his President. He was also President of the Russian Federation between 2008 and 2012 although it is easy for many to forget this, or indeed not to have noticed. "Together we will win!" exclaims the poster, prophetically. It is December 2007. Vladimir Putin, Russia's strongest, handsomest, most popular president of all time, is nearing the end of his second term in office. He cannot constitutionally continue as his country's dear leader any longer. It is time for the great man to fade into the political background. It is time for new leadership, new ideas, new militarism. Step forward, Putin's right hand man, Dmitry Medvedev. And step forward Medvedev did, then back a bit, then to the side a little, eventually finishing up just behind Putin's right hand side. From this understated position, Medvedev would launch an all out assault on the Russian electorate. 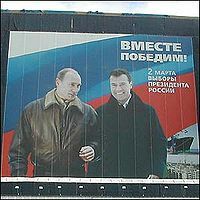 Everywhere one looked, be it on state-controlled television, state-controlled press or state-controlled public places, Medvedev and Putin would be there spreading their message: "If you love Putin, you'll love what Dmitry Medvedev has got up his sleeve: more Putin". Blasting their senses with political experience, strength of will and a winning smile, Vladimir Putin would travel across his vast land, campaigning for his man Medvedev. This would be a truly remarkable campaign, one which would make all the other candidates look insignificant in comparison. This so-called opposition couldn't even get on television! As Medvedev would point out: if the opposition parties couldn't control the media with an iron fist that crushes all opposition like puny little grapes, what hope would they have of controlling the largest democracy in the world? In 2012, Vladimir Putin once again ran for the Russian Presidency and won, as was expected. Naturally he allowed asked "Little Dmitry" to be his Prime Minister. Another government employee dutifully casts his votes. All the politicking, all the campaigning, all the idle threats, would lead up to the crucial day of March 2nd 2008. Not since the last Zimbabwean election had a vote been so hotly contested. Across the great transcontinental Russian landmass, men, women and children would come out in great numbers so that their collective voice could be heard. Such is the lure of the ballot box, that some voters would come out who hadn't previously been known to exist! 70% of the electorate who weren't currently in prison or political exile were to exercise their democratic right. Polls had suggested that Medvedev had the majority of support among the Russian people and, perhaps decisively, had the support of the billionaire Russian oligarchs. Would it be enough? The answer was a resounding "da". There would be parties on the streets of Moscow as a glorious victory was secured for Medvedev. On May 9th, a public holiday known as Victory Day, the Russian people would not only celebrate the Red Army's triumph over totalitarianism, they would also celebrate the inauguration of a new supreme leader. He has charmed a nation and has been taken to the hearts of the Russian people. From the youngest St. Petersburg socialite to the oldest babushka in Siberia, the love for President Medvedev knows no bounds. But who is Dmitry Medvedev? We don't really know much about him. 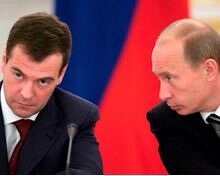 Extensive research reveals that Medvedev, like Putin, was brought up in St. Petersburg and graduated with a law degree. It is here that the similarities between the two end. While Putin entered into the KGB, Medvedev progressed into the exciting world of business. He was one of the top names in Russian timber in the 1990s. While Putin likes to relax by practising martial arts and baring his chest in the woods, Medvedev practises yoga and keeps ornamental fish. These subtle differences present Medvedev as a softer, more malleable type of authoritarian nationalistic ruler. When Medvedev was young and hopeful, living under the rule of the Soviet Union, he would sit in his small Leningrad apartment, listening to bootleg albums and he would dream. He dreamt of the day when he would be able to legally buy a pair of levis. He dreamt of the day when he could hear the music of Deep Purple, not on a poor-quality black market audio tape, but in person. He dreamt of the day when his country would be free. Young Dmitry's dream would come true. Deep Purple played a concert in Moscow in February 2008. You wish your president could transform into a dead guy, don't you? There are many reasons to vote for President Medvedev. There are his policies, which have already been proven successful by his predecessor. There's his stoic, unsmiling charisma. There's the promise for his voters' personal safety. However, chief among the reasons must be his dark thicket of raven-black hair. Compared to the very bald Putin, Medvedev enjoys a full head of the stuff, continuing a tradition of having heavily-follicled leaders follow the naturally plucked. The pattern has been unbroken since 1762: Catherine the Great hairy, Paul I bald, Alexander I hairy, Nicholas I bald, Alexander II hairy, Alexander III bald, Nicholas II hairy, Lenin bald, Stalin hairy, Krushchev bald, Brezhnev hairy, Andropov bald, Chernenko hairy, Gorbachev bald, Yeltsin hairy, Putin bald and now we have the joyously hairy Medvedev. Of course, when the time came for Medvedev to step aside there was a man of strength, courage and baldness to take his place: Vladimir Putin. In recent years, a strong, oil-rich Russia has re-emerged onto the international scene as a significant force in the fields of industry, culture and force. However, Russia's relationship with the democracies of the Western world has maintained an icy detachment. Could the arrival of a new head of state usher in a new era of warmth and co-operation with the West? In his inauguration speech, Medvedev promised to "protect civil and economic freedoms". Gerald Gullibsson, a noted international affairs expert, saw this as a very positive sign. "Medvedev is a liberal at heart," he says, "These promises give a clear signal that we are approaching a new era of international co-operation and diplomacy with the East. When you combine this with Iran's promises not to build a nuclear bomb and America's promises to leave Iraq, the future looks very good." Certainly one change of approach is to be found in Medvedev's policy of delegation, sharing the responsibility of representing Russia abroad. This is most clearly expressed in how the new President stayed at home during Vladimir Putin's state visit to France. 8th August 2008. With the world's attention drawn away by the Beijing Olympics, with Vladimir Putin thousands of miles away, the reknowned cowards of Georgia invaded South Ossetia's sovereign territory. It was a time for a real man to step forward and be strong. While Putin was discussing events with the US president and making many furious phone calls, Dmitry Medvedev ordered his masses of troops (who were conveniently stationed on the border) to liberate the South Ossetians. Showing remarkable foresight, Medvedev also sent troops into the region of Abkhazia, where Georgia was certain to strike next. There followed several days of fighting as Russia's brave troops forced the Georgian army out of the embattled Georgian Provinces. Against all odds, a heroic victory was achieved by the young president. Medvedev had proven himself as a war leader and as a protector of the Russian people, whether they live in Russia now or are going to live there in the near future. In the confusion and murderous rampages of war, some Russian forces found themselves occupying other areas of Georgia. This was not an overreaching attack on a retreating army, but a result of poorly made maps. Medvedev and his foreign ministry have worked on redrawing the maps and now Russian forces are back inside their own territory (well, it's their territory now). ↑ After Yeltsin's experiments with moonshine bankrupted the Russian economy, Dmitry was forced to enter politics. ↑ This mostly involved reassuring him that Russia wasn't going to attack a US state, whilst pointing repeatedly to a children's atlas. This page was last edited on 22 August 2012, at 06:54.